Last week’s series of hearings in the Minnesota State Capitol on legislation to reduce gun violence had an unintended and unforeseen outcome: Guns in society wasn’t the most pressing issue. Guns in the Capitol was. Hundreds of gun owners who opposed most of the proposals heard by the House Public Safety Committee swarmed the Capitol corridors and hearing rooms, out-organizing and, it turned out, out-gunning proponents of gun safety, who were heavily out-numbered. What’s more, an uncertain number of gun-control opponents, taking advantage of an obscure and dubious provision in the state’s gun laws, brought their guns with them to the hearings. The presence of so much heavy metal affected the mood of the hearings, the comportment of legislators and, in the end, suppressed the chance to have an open, wide-ranging, unfettered debate or discussion about what kind of gun laws a civil society should have in a time of mass shootings and psychosis that has left a trail of dead teachers, students, movie-goers, office workers and cops from one end of the country to the other. Some who came to testify at the hearings, including at least one legislator who briefly introduced two of the major gun control bills and then skedaddled, not to be heard from again, were clearly rattled to find themselves in a room packed with gun carrying opponents. More than 600 700 Minnesotans who have permits to carry weapons also have notified the Commissioner of Public Safety that they may exercise that right within the State Capitol and its complex, which includes 16 other buildings, thousands of state employees and daily visitors and which has no system of weapons screening and only a small contingent of armed State Troopers. I, myself, have both a “carry permit” and approval to carry a weapon in the Capitol. But, as I have argued elsewhere, allowing guns in the Capitol — Minnesota is one of only nine states to do so — makes for a tragedy that is waiting to happen. And not because of militant gun owners who have permits. They may be the least of the worries. The big problem is that guns are not screened, and security is minimal. Lesch says the problem of a Capitol bristling with firearms goes back to a flaw in the 2003 law, supported by then-Gov. Tim Pawlenty, that attempted to standardize the issuance of permits to carry guns. Rural sheriffs were pretty loose in issuing the permits when requested; big city police chiefs were not. The mandatory “shall-issue” law that was passed made the rules the same throughout the state. Now, more than 100,000 Minnesotans have permission to carry guns in public (contrary to public opinion, the guns do NOT have to be concealed), but the old rural-metro divide is troublesome to legislators like Lesch who believe there still are important distinctions between carrying a weapon in Cook County and carrying one in the Capitol. Most government buildings in the Twin Cities make efforts to keep out guns. The Capitol, by contrast, seems wide open, especially in the suddenly wide-open eyes of legislators and gun-safety proponents who were stunned to find the hallways and hearing rooms crowded with gun owners carrying guns into discussions about limiting the ubiquitous spread of guns. The heavy turnout of gun owners at the hearings was organized by the National Rifle Association and the Minnesota Gun Owners Civil Rights Association. The groups argue that they were only defending their rights, that they were well-mannered (most observers agree), and that those carrying weapons in the Capitol were legally entitled to do so. Fair enough. But leaders of the gun lobby are not so naive that they don’t understand that a mass turnout of gun-toting opponents to a law — ANY law — might seem a tad intimidating to the other side. After all, that’s why the U.S. sends aircraft carrier battle groups to the Persian Gulf whenever Iran gets rambunctious: To send the message that you better not screw with Uncle Sam. “The gun control advocates didn’t have the numbers, the facts, or even the majority of the committee on their side,” Andrew Rothman, GOCRA’s vice president, responded in an email. Well, la de da. Since State Troopers and Capitol security officers were on hand, it wasn’t necessary for the pro-gun crowd to flaunt their right to carry guns, was it? They might — try to imagine it, please — have publicly declared that, in the interest of free and open debate, they were leaving the guns at home. Insisting on their guns, in this situation, was, by its nature, an attempt to cow opponents and control the proceedings. Rothman is right about their comportment, as far as that goes: I agree that the pro-gun crowd was well-behaved. But, really? Are we supposed to applaud them for behaving? They might also have behaved, I hope, if they had done what Miss Kitty always asked the cowboys to do when they entered The Longbranch Saloon in “Gunsmoke:” Leave the guns at the door, boys. Fat chance. In Salem, Ore., this week, pro-gun protesters carried their weapons openly into the Capitol rotunda, slinging military assault-style rifles across their chests to make the old Charlton Heston war cry: You can have my gun when you pry it from my cold dead fingers. We are relying on the good behavior of gun owners to avoid such a display in St. Paul. The Minnesota Senate Judiciary Committee is scheduled to hold its gun legislation hearings next week. And while there has been speculation that guns might be banned from those hearings, little may come from it. Legislators are not too eager to grapple with guns directly. 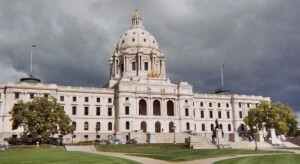 On Monday of this week, the House DFL majority met in private caucus to craft a House Rules proposal for the balance of the legislative session. According to those in attendance, the discussion turned, at one point, to a proposal to ban guns from the public galleries above the floor of the House, where a portrait of Abraham Lincoln — the first president to be assassinated — looms over lawmakers. Some Democrats confessed they worry that the viewing gallery could turn into a shooting gallery. But in the end, the proposal to put House galleries off limits to guns was dropped. Why? Because the majority of Democrats worried that such a move might cost them a seat in two out-state special elections that were held Tuesday (one DFLer won, one Republican won). That, of course, is exactly how they are being painted by gun owners who are packing the hearings, while packing guns. “The word is out: There’s not a whole lot of courage up at the Capitol,” said one activist on the side of passing gun legislation. The question now is whether anything will come out of the Capitol to reduce gun violence in the state. Most of the proposed legislation being discussed — banning assault rifles, limiting the capacity of ammunition magazines, requiring permits to buy bullet-proof body armor — are opposed by Republicans and rural Democrats, and seem to have little chance of passage. Gun control activists remain hopeful that laws will be passed requiring all gun buyers to undergo criminal background checks and requiring mental health problems to be scrutinized more closely before gun permits are issued. How can you talk about what to do about guns when the place you are supposed to talk about such things is dominated, intimidated and cowed by people carrying guns? Below: complete video of all five House Public Safety and Finance Committee hearings on gun violence held over three days at the Minnesota Capitol. HF237 (Paymar) Pistols and semiautomatic military-style assault weapon transfer and firearm possession eligibility provisions modified, and criminal penalties provided. HF240 (Schoen) Mental health screening improved for persons applying for firearm permits. HF184 (Winkler) Centralized register of individuals who voluntarily wish to be ineligible to purchase firearms for a self determined period of time maintenance and creation required; acceptance of voluntary surrender of firearms and ammunition from persons on the voluntary register and establishment of procedures for return of the firearms and ammunition upon request by chiefs of police and sheriffs mandated. HF244 (Johnson) Firearm loss or theft false report crime established, crime of transferring firearms to an ineligible person expanded, and a person convicted of these crimes made ineligible to possess a firearm. HF238 (Davnie) Offenders who unlawfully possess firearms on school properties equal penalties established. HF239 (Davnie) Persons who possess guns on private property after being ordered to leave the premises equal penalties established. HF241 (Hausman) Assault weapons; crime established for manufacturing, transferring, or possessing assault weapons; existing assault weapon disposal or registration provided for; terms defined; data classified; language clarified; and penalties provided. HF242 (Hausman) Large-capacity magazine crime established for the manufacture, transfer, or possession of ammunition feeding devices with the capacity to accept more than ten rounds or any conversion kit, part, or combination of parts; terms defined; and criminal penalties provided. HF285 (Lesch) Firearm lawful possession modified. HF308 (Simonson) Permit required to purchase, own, possess, or use body armor, and criminal penalties provided. HF307 (Simonson) Permit to carry application required to be made to a chief of police of a municipality, and if no chief of police, to a county sheriff. North Side Minneapolis neighbors took aim at the ways that systemic racism perpetuates the cycle of violence at a forum organized by Protect Minnesota. The forum, which as held at the office of Neighborhoods Organizing for Change on Broadway Avenue, included a call to oppose a bill in the Minnesota State Senate which they say criminalizes youth of color, rather than focusing on prevention. Milwaukee Jurors See Video of Shooting of 13-year-old youth by White "Gun Nut"